Years of the Ox: 1925 – 1937 – 1949 – 1961 – 1973 – 1985 – 1997 – 2009 – 2021. 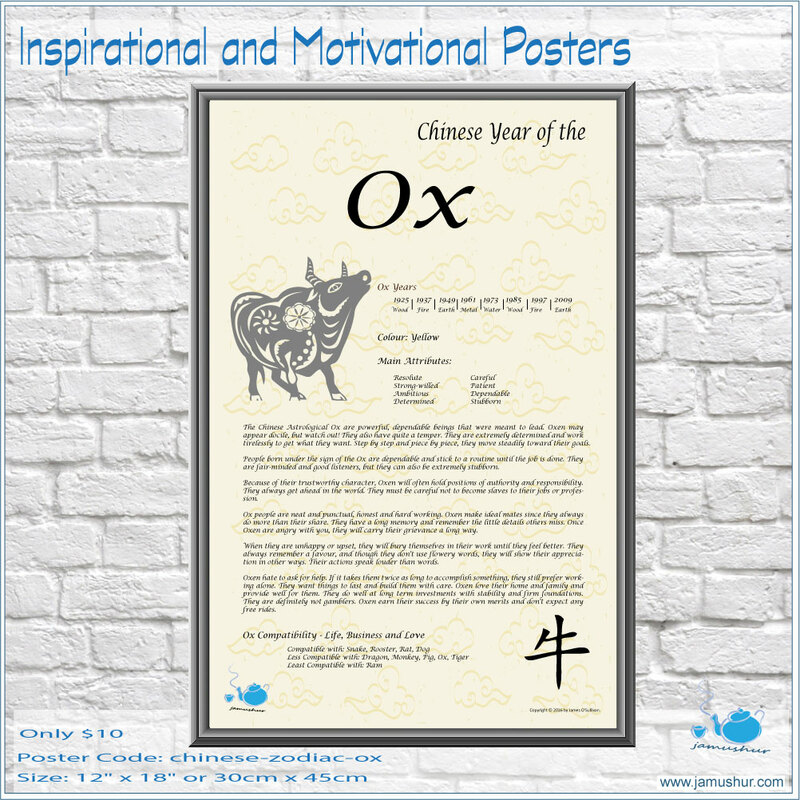 The Chinese Astrological Ox are powerful, dependable beings that were meant to lead. Oxen may appear docile, but watch out! They also have quite a temper. They are extremely determined and work tirelessly to get what they want. Step by step and piece by piece, they move steadily toward their goals. 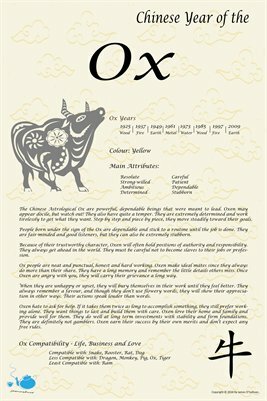 People born under the sign of the Ox are dependable and stick to a routine until the job is done. They are fair-minded and good listeners, but they can also be extremely stubborn. 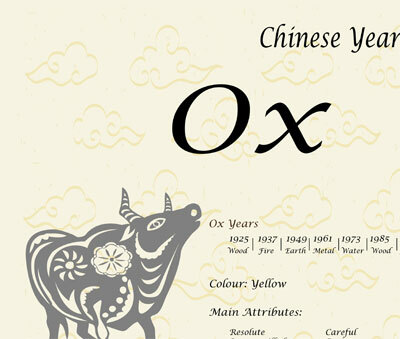 Because of their trustworthy character, Oxen will often hold positions of authority and responsibility. They always get ahead in the world. They must be careful not to become slaves to their jobs or profession. Ox people are neat and punctual, honest and hard working. Oxen make ideal mates since they always do more than their share. They have a long memory and remember the little details others miss. Once Oxen are angry with you, they will carry their grievance a long way. When they are unhappy or upset, they will bury themselves in their work until they feel better. They always remember a favour, and though they don’t use flowery words, they will show their appreciation in other ways. Their actions speak louder than words. Oxen hate to ask for help. If it takes them twice as long to accomplish something, they still prefer working alone. They want things to last and build them with care. Oxen love their home and family and provide well for them. They do well at long term investments with stability and firm foundations. They are definitely not gamblers. Oxen earn their success by their own merits and don’t expect any free rides.